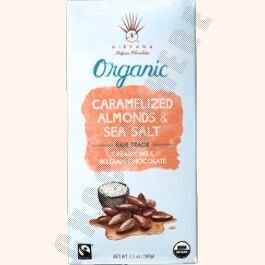 Nirvana Organic Belgian Milk Chocolate, filled with caramelized almonds and touches of sea salt to make an indulgence that is very hard to resist. Fair trade. Net wt. : 100g/3.5oz.